Pepino is an ancient Andean food that has so far been grown mostly for local consumption, but it's becoming more and more commercially popular for its mild flavor and health properties. Pepino's history of human use began around the 15th century, with the rise of the Incan Empire. It was grown widely in the Andes for its light, melon-like taste as well as its nutritional value, and it became a staple of the Incan diet. In fact, it was so popular that all naturally-occurring pepino varieties were used for food or cultivation and no known wild strains remain. Until recently, the plant was not widely grown outside of the South American countries where it is native. However, in recent years, it has been gaining commercial popularity as its health benefits have become better known. Regulating glucose levels. Pepino has been found to help keep blood sugar at a manageable level, as well as to improve the efficacy of insulin. Stimulating urination. Pepino has been traditionally used as a diuretic, and this is one of its most well-known attribute. Additionally, the strong antioxidant properties in pepino prevent cellular decay, an effect that is thought to be especially beneficial to the heart. The pepino plant contains several phenolic compounds, such as caffeic acid, cinnamic acid, coumaric acid, ellagic acid, ferulic acid, and rosmarinic acid, as well as flavonoids such as epicatechin, myricetin, naringenin, quercetin, and rutin. Both of these groups are essential for the pepino's antioxidant properties, and they are thought to be significant for its other medicinal actions as well. However, the mechanisms behind these benefits are not yet fully understood. Lucuma and yacon are herbs with a significantly low glycemic index that also contribute to reduce blood sugar levels in people with hyperglycemia and diabetes, whereas blueberry and green tea possess potent antioxidant actions. Pepino is believed to be mostly safe for oral consumption. However, it has very high levels of iodine, so consuming too much pepino could result in iodine toxicity - which causes nausea, increased salivation, and a metallic taste in the mouth - in those sensitive to the element. Pepino is not known to have any other side effects, but it has not been extensively studied, so the knowledge of its potential side effects is incomplete. The iodine content of pepino, if the fruit is overconsumed, may also cause medical interactions with certain drugs, including lithium, warfarin, and thyroid medications. Pepino may also worsen liver damage, particularly alcohol-induced damage, and should be avoided by those suffering from liver disease. As always, a doctor's advice should be sought before beginning any regimen of herbal supplements, especially for pregnant or breastfeeding women. While pepino has several medicinal properties, it currently has no medicinal forms of consumption. Instead, it is commonly used in cooking, which provides all of its health benefits. Pepino can be eaten raw, alone or in a salad, or it can be cooked and added as an ingredient to other dishes. It is also available canned or preserved. Generally, the pepino is eaten without its skin, as many varieties of this fruit have skins with a bitter, unpleasant taste. Pepino is gaining popularity worldwide and is likely to become easier to find around the world. It is generally sold fresh and raw, like many other fruits and vegetables. Fresh pepino fruits are most likely to be available in grocery stores, and it may be found in local markets as well, depending on location. They are widely available in South America. The pepino is adaptable to many different altitudes and longitudes, so it can be grown in many places around the world. If planted in the right conditions, pepino can be an ideal garden plant. It is easy to grow, and its fruits are ready to consume as soon as they are harvested. There are some challenges when growing a pepino plant, but a bit of effort will earn success. Cuttings are the advised method of propagation for pepino, and they should be placed two to three feet (1 m) apart when planted. Pepino cuttings should be planted in moist soil with good drainage. Pepino plants grow well in poor soil, and in fact, the soil should not be too rich, as over-fertilizing pepino plants can reduce their quality. It is advised to find a spot with full sun to partial shade that is sheltered from strong winds in order for the pepino plant to thrive. The pepino plant does best in soils with a neutral pH, within a range of 6.5 - 7.5. They can survive in soils with a slightly higher pH, but cannot tolerate more acidic soil. This plant similarly cannot tolerate salinity. Pepino fruits mature in summer and require temperatures above 26°F (-3°C). However, any temperature above 86°F (30°C) reduces the sugars in the growing fruit and results in lower-quality produce. Pepino has little drought resistance and should be kept moist with frequent watering. The pepino plant grows tall and tends to branch out, and it may require a trellis or other form of support to prevent the fruits from weighing down the stem. Pepino is a perennial plant, but it is often raised as an annual because fruit yield decreases significantly after two fruiting seasons. Because the pepino plant has a long period of flowering and fruiting - from two to three months - many gardeners raise pepinos in greenhouses rather than risk losing the fruits to short or cold summers. Some pests may damage the pepino plant, notably aphids, mites, and whitefly. Pepino is an herbaceous perennial plant with an abundance of foliage and thin branches. In appearance, it is similar to the tomato plant, growing to a height of two to three feet (1 m). Pepino's small, bright green leaves grow in pairs, and there are usually one to three pairs of leaves on each stem. Its flowers are small and range in color from blue or purple to white with purple markings. The fruit begins as a light green and slowly turns yellow with purple stripes and spots as it ripens. The flesh of the fruit is usually white or pale yellow. 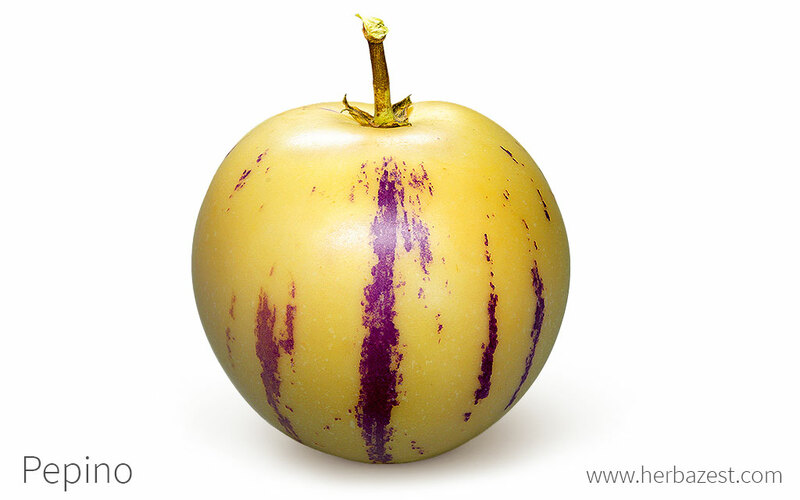 The pepino, Solanum muricatum, has several other colloquial names, including sweet pepino, pepino melon, melon pear, melon shrub, and pear melon, despite no close relations to either melons or pears. In Spanish, the word pepino generally refers to cucumber, and so S. muricatum is commonly called pepino dulce (sweet pepino) in order to make a clear distinction between the two. Pepino, classified as Solanum muricatum, is a member of the Solanaceae family, which consists of 98 genera and over 2,700 species. This family of flowering plants is also known as the nightshade family, and includes species of great economical importance, such as bell pepper (Capsicum annuum), eggplant (Solanum melongena), potato (Solanum tuberosum), and tomato (Lycopersicon esculentum). Because S. muricatum has been grown by humans since at least the 15th century, several different cultivars have been developed over the years. Some strains, particularly in the South American countries where the plant grows naturally, have not been named. However, other cultivars grown in other countries have been engineered and given names. New Zealand is known for growing the 'El Camino' and 'Suma' varieties, while California in the United States grows mostly the 'New Yorker' and 'Miski Prolific' types. There are not currently any wild species of pepino. The process by which it was domesticated is not fully understood, but it appears to have caused the extinction of the plant in the wild (with the exception of escaped domestic plants). However, S. muricatum is also closely related to S. caripense, a plant which does grow naturally in the wild. Although S. caripense does not produce desirable fruit on its own, the two plants together can produce hybrid offspring that grow edible fruits. It is not known when cultivation of the pepino began, but it was already an important and widespread fruit throughout the Incan Empire when the Spanish conquerors arrived. Amulets, drinking vessels, and other ornamental pottery have been found molded in the shape of the pepino, demonstrating its significance to the Incan people. The Spanish introduced the fruit to Europe in the 18th century, but since then, the pepino has mostly been grown in South American countries and has not been a popular exported good. Only recently has interest in the pepino grown, and now it is becoming a trendy addition to salads and other dishes in many parts of the world, especially Japan. Pepino has recently begun to be a commercially-grown crop in countries outside of its natural habitat. South America remains one of its largest producers, along with the United States and New Zealand. It is a popular food item in those countries and is becoming especially popular in Japan, where it is sold in high-end, trendy stores and restaurants. However, because it is such a new commercial crop, not much in-depth economic data is yet available. Gardening. Its unique appearance and surprisingly strong, fresh aroma make it an excellent choice for an ornamental addition to a fruit basket or another household decoration. Cosmetics, such as facemasks, may also contain pepino because of its antioxidants and refreshing scent, but it is not a common cosmetic ingredient. Pepino is a healthy and, according to many, delicious addition to most diets. It can be grown at home with a little effort, but it is also beginning to be available worldwide thanks to increasing interest in its glucose regulation and antioxidant properties.